DAVID HARE: I think by the balance of it is that it's all my personal impression and it's filtered through me. As Stephen Daldry said, the play is not about Israel and Palestine, it's about you and what he meant by that was that I was seeing two societies which -- in which everybody has to think very deeply about what they believe. In the West, we can say we believe things. We can say that we're Socialists or Capitalists. We can say that we're Christians or not Christians. We can say that we are convinced about this or convinced about that, but we're not tested. And I went to two countries where what you believe will determine where you live, which street you live in, who your friends are, what school your children go to -- everything in these two countries is about faith and belief and everything is something you are going to have to argue with your near neighbor. And so the subject of the play is what is it like for somebody who has, as it were, no faith or at least whose faith is never tested to go to a place where faith is absolutely everything. And so in that way I was drawing attention to the similarities between the two communities, the Palestinians and the Jews, as much as the differences between them and I think it's that which stopped people finding it unbalanced. The only objections -- literally in a year of playing it -- the only objections that I had were occasionaly from supporters of the settlers who felt that I was unfair to them. And I have had two Palestinians only who have complained about aspects of the way Palestinians were portrayed. But those have literally been the only complaints about the portrait of either community that I have had in a year. DAVID HARE: I'm not an actor and so, you know, I was 51 and making my stage debut. Via Dolorosa is the only thing I have ever acted in my life, professionally, and I'll never act again. I'm a playwright and I did it purely and simply because it was the only way to convey what I wanted to say about the region. But I had to play thirty-three characters and so plainly I'm not Peter Sellers, I can't impersonate people. And so through the work of the director, Stephen Daldry, I hope I became a sort of medium for these people. And I did give them intonations or characteristics perhaps which is the most I could hope to do, but we both realized pretty quickly that for it to become the kind of -- putting on one hat and then another show - would not actually -- It would honor neither the people nor me. It wouldn't play to my strengths. But what I could give them I hope is the emotional reality and the passion and the humor and all the vitality that I felt of them. Because I think, one of the characteristics that everybody remarks about Via Dolorosa was that -- I don't meet anyone of them among the thirty-three people who isn't both opinionated and full of life. I think one of the reasons for the extraordinary reaction to the play was that Westerners found it refreshing to meet people who felt so strongly and who expressed themselves so brilliantly. PRODUCER: Were there any works of painting or literature or theater that you looked to as models of Via Dolorosa that combined reporting with art? 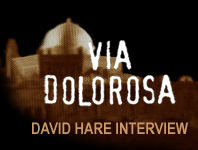 DAVID HARE: I think I was only evidenced in a negative sense. I think that I find fiction about -- Well, let's say it's the Jewish tradition that knowledge is as important as imagination. And so in some way I think its true that Jews traditionally distrust fiction. In other words, why make up stories when the world is already incredibly various and interesting. Surely our job while we're here on Earth is to learn about the world not to create parallel universes. And there is a Jewish genius for science, for learning, for interpreting the world rather than -- in other words, Freud, Marx, its no coincidence that the great -- Einstein -- that the great interpretative geniuses of the last 150 years are all Jews. And they're all, in their way, scientists rather than romanticists, rather than makers up of stories. And similarly I felt that with this subject matter, the facts, authentic reporting was terribly important and I don't find with very great subjects -- I find fiction about very, very important subjects rather offensive. I think Schindler's List is a rare example of a film, which by its integrity successfully convinces you it has the right to address the subject that it is addressing. But I would say it is almost, it is one of very, very few concentration camp films that I have not found profoundly offensive. And I think with the great -- the very, very important subjects you have to be careful what you are doing by fictionalizing them at all. In the play, I mention that when we go to the Holocaust museum paintings of the concentration camps are so much less powerful than photographs. The art in the Holocaust museum seems gratuitous and stupid. You just think why is an artist interposing himself between you the viewer and the experience that you can get from the records, the objects, the photographs and art in that sense seems gratuitous. And the effect of Via Dolorosa I hope is to bring people as near as possible to the subject matter itself without a whole load of gratuitous, interpretative gloss from me. The one thing that Via Dolorosa has is no opinions. To me curiosity is 50 times as valuable as opinion. There are enough opinions about the Middle East where as there is too little knowledge. DAVID HARE: Yeah. But It is a very transient, you know -- if I express an opinion and if I have a shock of an opinion it is a very transient thing. There is a moment in the car where I sit, saying, "Oh my god, suddenly I thought the Jews don't belong here." But the thought was no longer there than it was gone. What I was trying to express was on a hot day all these thoughts bubble up. But I really do eschew opinion because I don't think it's useful and also I don't think I have the right to it. I think Jews and Palestinians have a right to it because they know so much more about it than I do. But I have similarly eschewed any kind of interview, I won't appear on the notepaper of any organization, I won't give speeches about the subject because my value is as someone who has no axe to grind. That's the only value I have -- as honest witness. And that is all I have. And many, many worthy organizations have asked me to speak and go and, as it were, be an expert, but actually I am more valuable as a witness. DAVID HARE: The idea of the play is that I step in and out of the play all of the time. And that meant that I -- we were always trying to throw the focus either on to the events or on to my reaction to the events. And Stephen gradually produced this wonderful path through the evening whereby I -- the audience slowly realized that I was both in the events and describing them. And I think one of the effects of one-man shows is that you feel that at the end of the play you know the person on the stage terribly well. And there wasn't a night where there weren't lots of people waiting for me at the stage door. At first this alarmed me because I'm not used to that as the playwright. The playwright's an anonymous figure. But the reason they were waiting for me was they felt they knew me because they'd spent an hour and a half or more in my company. So they wanted to give something back. They wanted to tell me what they felt because they had listened to me talk about what I felt. So a lot of people who - say would be waiting if I were going out to supper afterwards they'd say but you stay and talk at the stage door for a very long time to these people and I would say, well, I feel you have to because that's a one man show. That's the exchange. And the least that you can do after they listen to you is for you to listen to them. And actually as I listened to them I learned all sorts of interesting things about Israel and Palestine. It was quite educational for me, that 20 minutes at the stage door every night. DAVID HARE: When I see plays in which there is a colonial power and the colonized, I always identify naturally with the colonial power, I think of myself because I'm English, I don't know how I couldn't. Whereas I assume that if you're Irish, you identify with the colonized in every story. But of course I saw it that way round, I had to see it that way round. But that didn't, I hope, mean that I didn't do everything I could to understand the position of Palestinians. The Palestinians feel so strongly that they are not represented or understood culturally in the West that many Palestinians said the same thing to me about the play which was, "We don't mind what you say about us, just to hear the word 'Palestine' on a London stage or a New York stage is such an advance for us." Even to be on the radar is an advance because they feel themselves so culturally dis-empowered. And one of the deeply satisfying things about the show was simply to be able to talk about Palestine. And I think again it was a tribute to the maturity of the Jewish community in New York that they at last welcomed somebody who came to talk about Palestine as much as about Israel. The hostility that we thought the show would attract in New York -- I was absolutely astonished to be invited to do the show in New York. I had expected that I would be told that it would not be welcome here. But on the contrary, the atmosphere had so changed among Jews in New York, that I was received with nothing but politeness. It's true there were people who called out. It's true, there were occasional protests but there was no organized lobbying against the show at all. There were no pickets there were -- there was no trouble of any significant kind. And so I was very impressed with that. I was as impressed by the maturity of the audience as anything. PRODUCER: With all that you have been through and all the work you did what are your thoughts about the possibility of peace in the region now. DAVID HARE: I suppose I feel that something has tilted in the area. Obviously I wrote at a very low point. I wrote at the point of Netanyahu's government. And plainly whatever one's view of Netanyahu, he was not a man interested in serious accommodation with people who - there was plenty of evidence - he fundamentally despised. Barak plainly is a different person. And I think there is a sense that whatever the future holds it is going to be different than this passage. We're coming to the end -- partly because of the problems of the geritocracy in the Arab world in other words an awful lot of their leaders are very old - but we are coming to the end of a particular passage. What form the new passage will take we don't yet know. But it does seem that this particular post-Oslo period is pretty near its end.